A media group consisting of people from six countries praised the development and stability of northwest China's Xinjiang Uygur Autonomous Region after visiting the area. 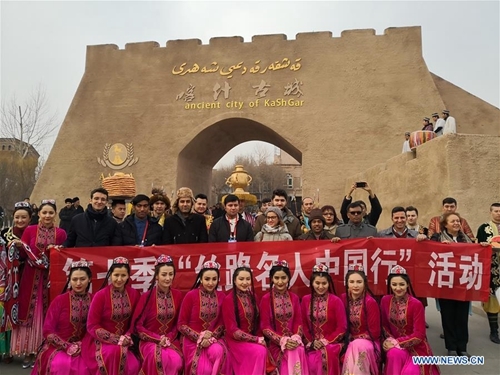 The Silk Road Celebrity China Tour was held from Jan. 9 to 16 in Xinjiang, with 12 media representatives from Egypt, Turkey, Pakistan, Afghanistan, Bangladesh and Sri Lanka visiting Xinjiang locals as well as a vocational training center. The media group said that the Chinese government's successful experience in governing Xinjiang deserves praise. The group visited a transportation hub where China-Europe freight trains converge in Urumqi, the regional capital, and conducted live coverage of the trains. Shiabur Rahman, an editor with Bangladesh's Daily Sun, said that the China-Europe freight trains brought Xinjiang closer to the rest of the world. As the front gate of China's opening-up westward, Xinjiang's economic development will become increasingly better. Abdul Matin Amiri, with a weekly publication from Afghanistan, said the display of unity and joy from the locals is completely different from what some media in the West describe, adding that Xinjiang is developing well under the leadership of the Chinese government -- cities in the region are thriving and people are living prosperous lives. The reporters also visited the once poverty-stricken residents who have relocated from the mountains and are living modern lives in newly-built houses. Erdal Kurucay, with Turkey's ATV, said the happiness exuded from the once poor residents showed Xinjiang's rapid economic development and the success of China's targeted measures in its anti-poverty campaign. The media group also enjoyed an ethnic minority music performance by a Xinjiang folk music orchestra. Misket Dikmen, president of the Izmir Journalists Association of Turkey, said that Xinjiang has done a good job of protecting and promoting minority cultures. They also visited the Id Kah Mosque, one of the most renowned mosques in Central Asia. Shiabur Rahman, the Daily Sun editor, said that before he came to Xinjiang, he heard that the Chinese government did not allow Muslims to worship, but after his visit, he found that the government does not intervene in normal religious activities and religious freedom of the Xinjiang Muslims has been effectively protected. The group also attended an exhibition of major cases related to violence and terrorism in Xinjiang. Xinjiang has effectively prevented the incidents of violence and terrorism and safeguarded people's lives and property in the region through taking effective measures, said Shiabur Rahman, adding that the Chinese government is a very responsible one. After visiting a vocational education and training center in the city of Kashgar, Turkish ATV reporter Tugcenur Yilmaz said that trainees are learning laws, Mandarin and skills in the center, which plays an important role in de-extremism. Shiabur Rahman said those people were once affected by extremism and religious fanaticism. He said that such training has made a great contribution to the non-occurrence of violence and terrorism in Xinjiang in the long term. Bangladesh has been impacted by extremism as well, and that he would bring the experience back to his country, Shiabur Rahman said.